"Sampath Speaking" - the thoughts of an Insurer from Thiruvallikkeni: WI beats India in Semis; WI women too enter finals ~ something from the past ! 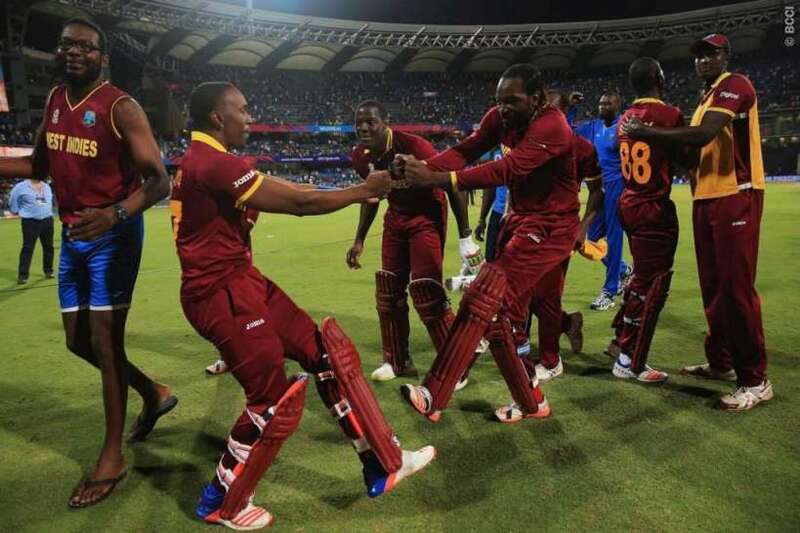 WI beats India in Semis; WI women too enter finals ~ something from the past ! Decades before, we had IPL , Mumbai Indians and more – in Triplicane and elsewhere, there was a special group – West Indies supporters who arrogantly believed that WI were the only team capable of muzzling down every other team. It was extraordinary – when so much was happening in India, Lendl Mark Platter Simmons perhaps was only watching thousands of miles away at home in Caribbean. Andre Fletcher got a lifetime chance because Chris Gayle was not allowed to open – he made it his big day – and in the next match against minnows Afghans, which WI lost, he damaged a harmstring. Clive Lloyd, West Indies' chairman of selectors, calls him immediately - Simmons gets his feet off the sofa in his home in Trinidad and tells Lloyd he is in. He lands in Mumbai on Tuesday to join the West Indies squad. He has taken two flights, flown across the continents and straightaway hit training. He knows Mumbai, can get down at Airport, perhaps tell the cabbie in Hindi of the address or more – every cabbie knows him and his purpose !! Clive Lloyd was at helm during the golden period of WI. In 1979 WC, West Indies won by 92 runs and retained the Prudential Cup and the title of world champions which they first won in 1975. On another fine day the ground was completely filled by the all-ticket crowd of 25,000, and many would-be spectators were locked out. For a long time England put up a gallant fight after Brearley had won the toss and sent in the opposition to bat. The absence of Willis, injured in the semi-final, probably made the West Indies' task easier although his replacement. Ninety minutes into the 1979 World Cup final against England, West Indies were struggling. They had slipped to 99 for 4 when Collis King, the last of the frontline batsmen, came out to join Viv Richards. What followed was a breathtaking partnership, but surprisingly, Richards was mostly a spectator as King slaughtered the England attack at the other end. In reply to West Indies' 286 for 9 in the 1979 World Cup final, England made steady progress !, instead of going after the gentle offspin of Viv Richards, Geoff Boycott and Mike Brearley were milking him for singles. Geoff Boycott, who speaks so much on mike had taken 17 overs to reach double figures, was on strike shortly after tea when he came down the pitch to Richards and mistimed his stroke. The ball arced gently to Clive Lloyd, an outstanding fielder, fluffed the catch at wide mid-on, ending up on his back with the ball on the turf close by. Was that deliberate would be the discussion, if it were to happen now !! In the WC 60 overs Finals Brearley made 64 off 130 and Geoffery Boycott made 57 off 137 ! .. Viv Richards made 138 off 157, Collis King made 86 off 66. All along, batsmen have had to find innovative ways to keep the runs ticking. Scoops, paddles, dabs and strike rotation have been the key largely due to surfaces on offer. The first sign of a true surface and the belligerence of the batsmen came to the fore at the Wankhede Stadium in a high-scoring clash that West Indies Women won by six runs - their first semi-final victory - to set up a final date with Australia Women in Kolkata on Sunday. West Indies, all swagger and substance, challenged the might of New Zealand's spin trio of Morna Nielsen, Leigh Kasperek and Erin Bermingham to post an imposing 143 for 6. NZ eventually finished on 137 for 8 as West Indies broke their semi-final voodoo after three failed attempts. Britney Cooper was the principal destroyer for West Indies as she made a belligerent 48-ball 61. However, it was far from a one-woman show as Stafanie Taylor, the captain, and Deandra Dottin played their part in injecting momentum. The inspiration had been sown a couple of months ago at Mirpur. Keacy Carty and Keemo Paul batted for 20.3 overs to wipe out the 69 remaining runs needed to win their first Under-19 World Cup title. As West Indies drew closer to winning their first Under-19 World Cup, Gidron Pope came rushing out of the dressing room towards the team dugout and saw all his team-mates sitting down. They needed nine from the last two overs and he knew they were going to win. Pope got everyone on his feet. The players, the head coach, the physio, the bowling coach, the team manager - all of them formed a line with arms around each other just beyond the boundary line, ready to burst on to the field as soon as the winning runs were struck. They cheered when Keacy Carty reached his half-century in the penultimate over, and took off when Keemo Paul sent a top-edge flying over the wicketkeeper. At Mirpur in Feb 2016 West Indies 146 for 5 (Carty 52*, Paul 40*, Dagar 3-25) beat India 145 (Sarfaraz 51, Batham 21, John 3-38, Joseph 3-39) by five wickets to win the U19 WC finals. At Wankhede, it was a spectacular performance by WI. A man who was caught off a no-ball twice truly turned their fortunes. Virat Kohli's 89 not out off 47 balls was nothing short of a batting clinic, but Lendl Simmons 82 not out off 51 balls led a West Indian demolition job that left India's chances of winning another title at home in the rubble. A target of 193 would not have frightened Darren Sammy. He had been talking up Chris Gayle all through the World T20, but seven balls into the chase, he might have felt nervous. His kingpin was clean bowled by Jasprit Bumrah and Marlon Samuels, who won this very trophy with one of the finest displays of T20 batsmanship, went away without a peep. West Indies were 19 for 2, already the required rate had hit double-digits and the men they had in the middle were Johnson Charles, who accumulates dot balls like his partner Simmons, who had arrived in India only two days ago, had accumulated air miles. Two of the most unheralded batsmen in this power-packed line-up hit one boundary an over from the second until the 14th - which Kohli himself bowled and got rid of Charles with a juicy long-hop. Ashwin is considered the leader of India's bowling attack, particularly in home conditions. He ended the World T20 - a tournament held in India, on pitches that have by and large helped the spinners - having delivered only 15 overs in five matches, the smallest workload of India's four frontline bowlers. Ashwin bowled his full quota of overs in only two of the five games, against New Zealand in Nagpur and against Bangladesh in Bangalore. He only bowled three overs against Pakistan on a Kolkata pitch offering plenty of turn, two expensive overs against Australia in Mohali, and two overs in Thursday's semi-final against West Indies in Mumbai and conceded 20 in that. It was dew factors which was against spinners perhaps. Sir Jadeja had a torrid time with the ball, conceding 48 off his four overs. It was a great match Kohli showed another dimension running twos. After Thursday's semi-final at the Wankhede Stadium, he had hit 24 twos in the tournament. Dhoni started with a master plan bringing in Manish Pandey for the injured Yuvraj and ….had place for Ajinkya Rahane, dropping Shikhar Dhawan. Things appeared well for India, till the stormy Lendl Simmons 82 off 51 with 7 fours, 5 sixers and Andre Russel 43 off 20 with 3 fours and 4 sixers, turned the tide. Great performance by the West Indies – the Mumbai Indian was outstanding against the whole Indians.